Molecular Hydrogen has literally exploded onto the scene in the last decade, emerging from Japan as a result of the antioxidant research of cardiac surgeon Dr. Hidemitsu Hayashi, now continued with expanded investigation by Dr. Lee of Korea, Tyler LeBaron of the US and others. In ten years, this new field of functional medicine has expanded research from 5 published papers in 2007 to over 500 clinical studies completed to date. LeBaron has brought forth an extraordinary amount of knowledge in molecular hydrogen and this vast compendium of science can be accessed on his Molecular Science Foundation website here. There is also a Molecular Hydrogen Institute at Nippon Medical School in Japan. Dr. Shigeo Ohta of the Graduate School of Medicine at the Nippon Medical School likewise has committed his life to the exploration of hydrogen medical sciences and working within the hydrogen industry to pioneer hydrogen medicine. The fundamental element composing 90% of the known universe - HYDROGEN. Stars shine because of it, jets fly by it, and people live because of it. Yes human beings are like stars in that hydrogen is the fundamental unit of combustion in the little cellular energy organelles we call mitochondria. In 1978 Peter Mitchell received the Nobel Prize for the discovery that hydrogen is the long-sought "high energy intermediate," the key to ATP production. It is also the most powerful and basic anti-oxidant in all biology, supporting Nrf2 pathways in creation of Super-oxide Dismutase, or SOD, the body's own anti-oxidant molecule. 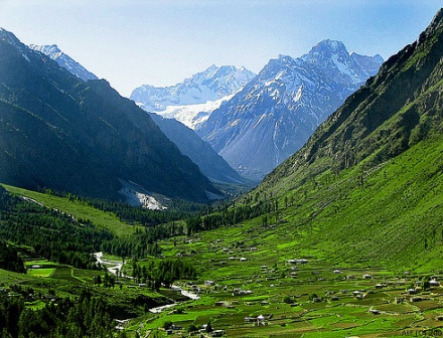 Certain special locations of the world have been known for their healing waters like the Nordenau valley in Germany, Tlacote, Mexico, and the Hunza valley in Pakistan pictured to the right. In traveling to these regions Dr. Ohta tested the waters and saw they were rich in hydrogen - the key to their healing properties, e.g. selective scavenging of free radicals. But is drinking H2-rich water as effective as inhaling H2 gas, or stimulating probiotic bacteria to increase H2 gas production? Scientific studies indicate it actually may be the best method. In fact, one study showed that drinking H2-rich water, but not inhaling 2% H2 gas or increasing intestinal H2 production via lactulose administration, was effective in preventing induced Parkinson's disease in rats (Ito, M., et al. 2012). Another reason that drinking H2 water is important is because it allows gastric induction of ghrelin, a growth hormone which regulates apetite along with distribution and regulation of energy. (Matsumoto, et al., 2013) The consensus is that not only is drinking H2-rich water the easiest, it is often the most effective. (Ohno, K., et al., 2012) For more clinical evidence on H2 water examine the plethora of papers exhibited at Molecular Hydrogen Studies. Anti-oxidant scavenger of free radicals, and through the Nrf2 pathways and others, supports the production of natural human anti-oxidants like SOD. Small size allows H2 to penetrate cells easily for intracellular action. Oxidative stress is widely recognized as the principal factor in aging. 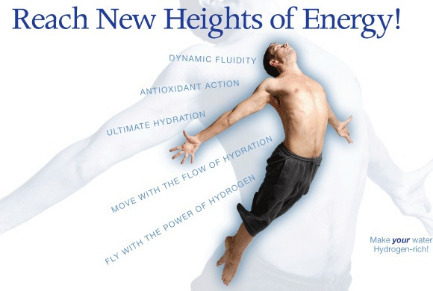 Molecular hydrogen works to improve cell signals, cell metabolism, and gene regulation, its cell signal-modulating activity affording it with anti-inflammatory, anti-obesity, and anti-allergy benefits, and anti-apoptotic (or anti-cell death) properties. This translates into anti-aging support. As we age, ATP production declines, and we lose energy or may even experience mitochondrial disease. Energy on demand is available from hydrogen-rich water due to the rise in ATP production from increased presence of molecular hydrogen. Athletes in particular notice the energy increase and reduction in lactic acid. Albert Szent-Gyorgi discovered that many of the major organs like the kidneys and liver store hydrogen for use in detoxification. Over 500 peer-reviewed articles demonstrate hydrogen to have therapeutic potential in essentially every organ of the human body and in 150 different human disease models. One of the very first dedicated hydrogen producing products on the world market, it remains a top choice by virtue of the exceptionally fine taste and texture of the water. The lower ppm value is compensated by the day-long regular intake of this hydrating hydrogen-rich water. Carry the bottle with you wherever you go and have hydrogen on demand. NOTE: Bubbles pictured are artistic, in reality the hydrogen bubbles are often microscopic. The most exciting high concentration tablet known to date and one that leaves the competition in the dust. If you are an athlete or anyone who needs extra energy, help with high levels of oxidative radicals, or want to really support your flora to flourish, this product fits the bill. Tested at 8-9 ppm in the first two minutes after the tablet dissolves. This hydrogen is your ticket to competition victory with dramatic reduction of lactic acid. 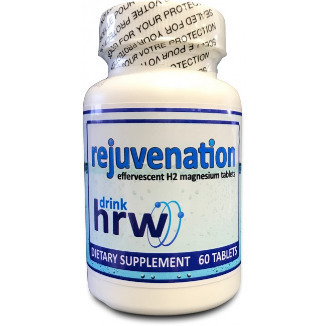 I can’t thank you enough for turning me on to the Rejuvenation hydrogen supplement. Since I have been taking the hydrogen my energy is higher, my endurance is longer, squeezing in the last two reps with the extra power to push to the next reps. It is good for stamina, good for people working out day in and day out, like I do. I’m always ready for the next workout, without any resistance. I start work at 5 am and we train until 8 pm, and I feel strong all the way throughout the whole day; I feel I have more oxygen and energy throughout the days even though they are long. Also, I noticed my concentration and focus are sharper. Getting up early in the morning to train used to be difficult, but now I find it easy, I am excited and my mind is sharp and focused and the focus lasts all day. I actually look forward to my workouts more than before. This supplement is unique in my experience; there is a lightness to myself, like nothing else; I find my weight work lighter and easier. Recovery time is shorter, I don’t feel as sore. Now, after a week without the tablets I am feeling more fatigue and soreness from lactic acid build-up. Thanks for the information. I will speak with the doctor regarding a research project involving the water sticks when he comes back by. I tried one for one day and I ran about 2 1/2 min faster on a 5 K distance than I did last week on the same route. Basically I was amazed at the difference because I run my pace based strictly on my heart rate. I hope to be in touch soon and I think we may be able to help each other. 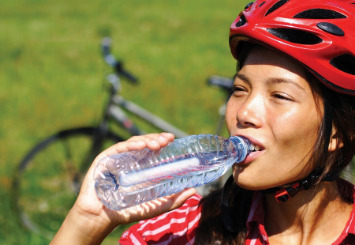 I have been using the Hydrogen-Stick in my camelback during my cycling training sessions for 26 days now. Wow, what a great product! The results are amazing. I have been able to trim my 3 mile sprint times by an average of 30 to 35 seconds while maintaining the same heart rate. My 20 mile times have improved by MINUTES!!!! Previously I have used a variety of goos and supplements; however, all have benefits and negatives on my performance. With the Hydrogen -Stick, I have been able to achieve a more sustainable power curve with no drop off effect. Our race team has now begun using Dr Hayashi’s product during our racing series. I will keep you posted as we have more results. Thanks for your amazing product. Whether you are an athlete, someone who likes to work out, or simply someone looking for better health and wellness all the time, the antioxidant power of Hydrogen will enhance your overall well-being. Drinking water with my H2 stick is becoming a healthy fascination for me. I was diagnosed 2 years ago with Diabetes and it has been an effort to take my sugar levels on a daily basis. I really dreaded the results. But my “numbers” have improved so much, since drinking my H2 water; I actually look forward to the “finger stick” to see the numbers now. My blood sugar levels have dropped an average of 17% and my “highs” are now what my “lows” use to be. But that is not the whole story. I am much more energetic, feel better, happier and more relaxed. I also love the improvement in my complexion. Wrinkles are disappearing and I really feel younger. Each evening I pour my H2 water into an elegant crystal goblet and celebrate the waters of life. I have been drinking the water for only two weeks: 3 sticks / bottle. I continually had thrush with my COPD (chronic pulmonary/heart disease). Since I have been brushing my teeth with the water, the thrush is no longer present. I'm not getting up to urinate during the night anymore, where before I was up 5-6 times a night. My face changed immediately. Everyone comments that I look younger. My skin was very thin and bruised easily for the past 5 years. The discolored blotches just under the surface of my skin have gone from purple to very light. They are almost gone, and my doctor is amazed. I have increased energy, stamina, and vitality. My quality of life has improved. Drinking the water is the only thing I've done differently in the last two weeks. After a few years I am getting back in the gym at the age of 56. It was exhausting and tiring and my muscles were so sore - until I started taking Rejuvenation H2 before my workout. Just one tablet in the morning and I was hydrated throughout my afternoon. And, I felt strong, energized and remained so after my workout with no soreness in my muscles. I've been using my far infrared sauna to help with my joint pain, and honestly Rejuvenation has been the missing link. After my sauna I take a glass and I am refreshed and pain-free. Watch issues dissolve away with the antioxidant power of hydrogen.